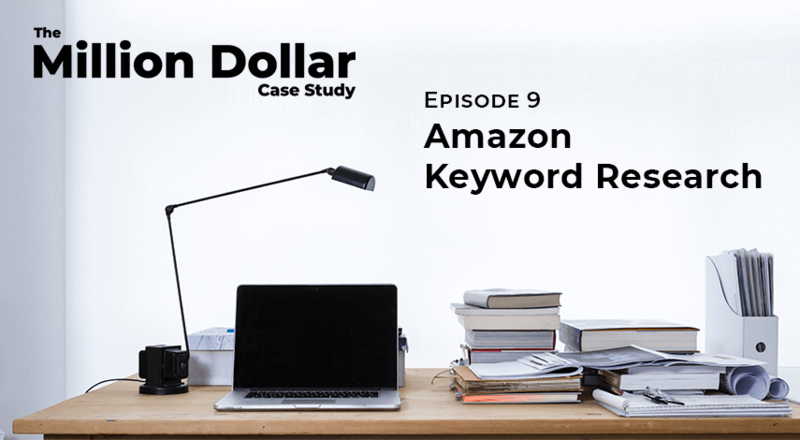 In this episode, we cover how to conduct keyword research and how to create your Amazon FBA listing. 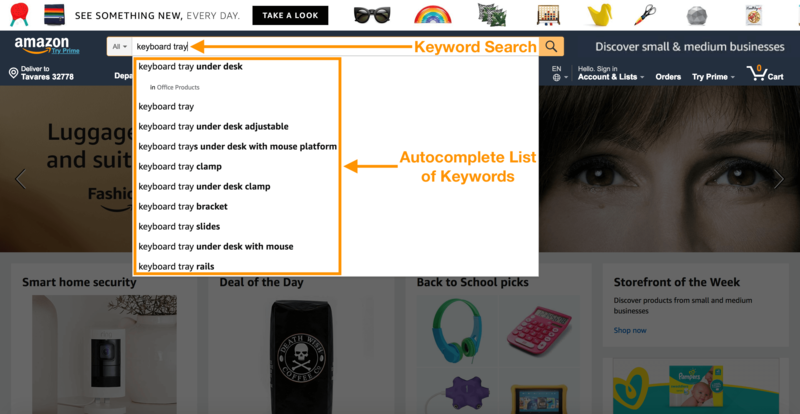 Why is keyword research important for Amazon sellers? 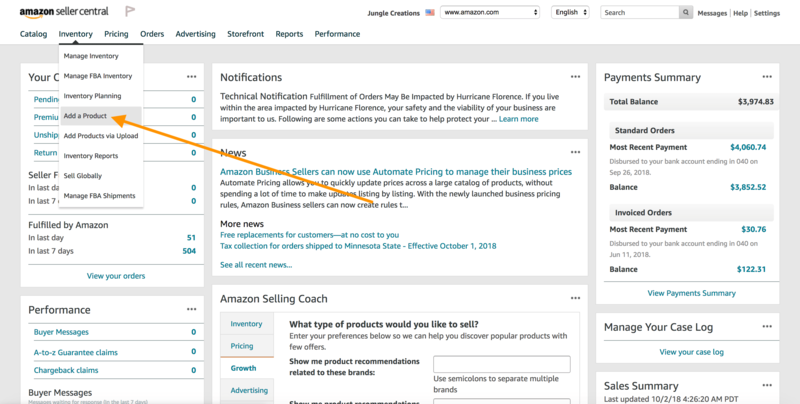 How to create your listing on Amazon’s Seller Central platform? We’re covering all of this today in our ninth episode of the Million Dollar Case Study. Watch the video, keep reading and don’t forget to download your FREE MDCS Workbook at the end of this blog post! Today, we’re going to cover how to conduct keyword research and creating a killer listing on Seller Central! Figure out what words people are searching for so you can craft the perfect listing and be indexed for the keywords that people look for the most. Know what keywords you want to bid on when we launch our Amazon PPC (Pay-Per-Click) campaign – we’ll cover this topic in depth in a later episode. Whenever I’m conducting keyword research I always begin by doing a basic search on Amazon. Let’s head over to Amazon.com so I can show you what I’m talking about. I’m going to run a search on one of the keyword phrases I think is relevant to the product we’re launching this season – “keyboard tray”. As I begin to type in the search field, Amazon’s autocomplete feature kicks in and generates a list of potential keyword matches. These autocompletes are based on real customer searches. This is how they end up finding a product like the one we’re looking at! The only downside is that there are tons of different ways for a customer to describe a product like this in a keyword search. “Keyboard tray” may not be everyone’s first search – so I need to make sure I’m incorporating adjacent keywords to attract more customers. 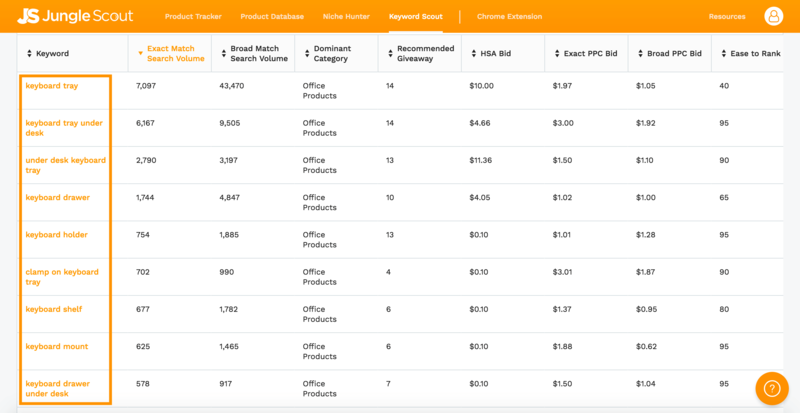 Inside the Jungle Scout Web App is a tool called Keyword Scout – the most comprehensive Amazon keyword search tool on the market. We get all of our search volume data from Amazon, so you’re guaranteed to see only real customer searches from the Amazon search bar. Secondly, the results that Keyword Scout gives you from your seed keyword (keyboard tray) are highly relevant and don’t necessarily include the seed keyword, but give you a broader picture of relevant keywords. For example, I’m going to search for “keyboard tray”, and the results that I’m given here don’t necessarily include the term “keyboard tray”. Now, remember on Amazon when I typed in keyboard tray? It only gave me a list of keywords that started with the phrase “keyboard tray” and added some keywords after. Other keyword tools on the market do the same thing. Jungle Scout’s Keyword Scout gives you words that Amazon customers search for and keywords for the product they ended up purchasing, even if it wasn’t the exact keyword! For example, People that searched the term “keyboard stand” have purchased a keyboard tray. People will search for “standing desk converter” and then end up buying a keyboard tray. People search for an “under desk drawer” then end up buying a keyboard tray. 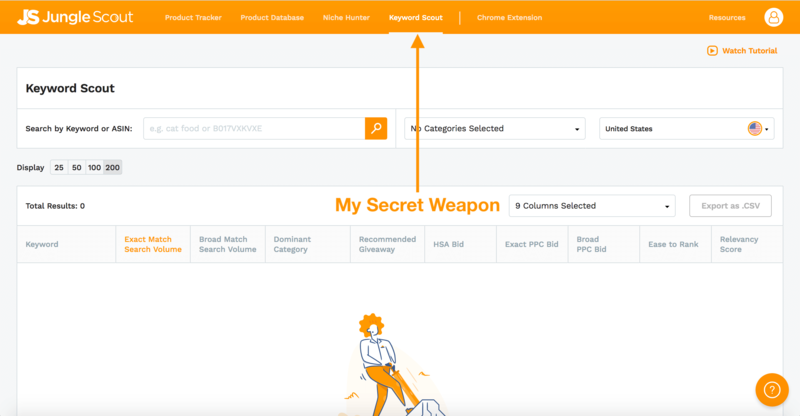 There are so many ways to get to an Amazon product and Keyword Scout allows you to see every keyword path. 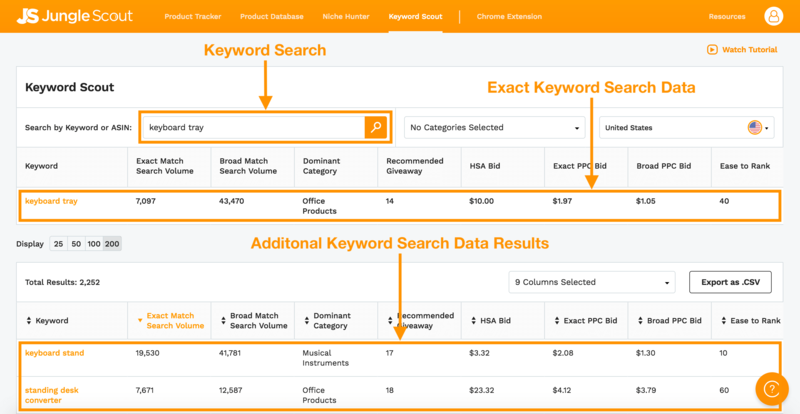 Keyword Scout is broken down into several columns that cover a broad range of essential information for building your listing. Keyword – a particular word or phrase that describes the contents of a Web page. As it relates to Amazon, keywords are intended to act as shortcuts that sum up an entire Amazon listing. Exact Match Search Volume – the number of Amazon searches over the past month that exactly match the keyword, EXCLUDING plurals, and misspellings. Broad Match Search Volume – the number of Amazon searches over the past month that broadly match the keyword, INCLUDING the phrase, plurals, misspellings or synonyms. Dominant Category – this column refers to the most popular parent category across the top 10 ranked listings. Recommended Giveaway – this is the estimated number of daily promotional giveaways required to reach a top 3 ranking in 7-14 days. 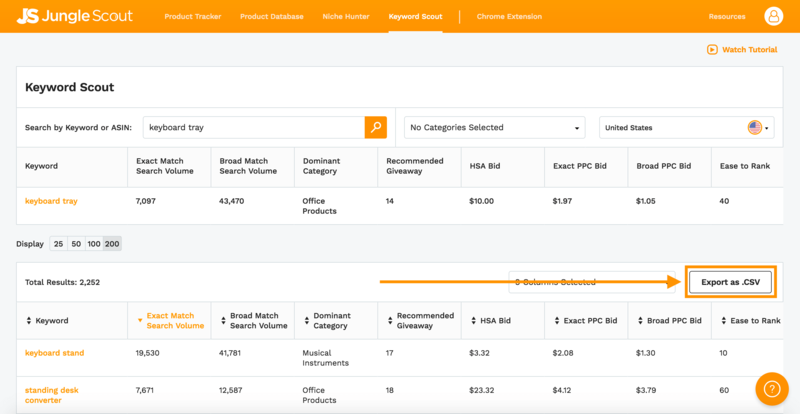 HSA Bid – the estimated exact match Headline Search Ad Bid for a 90% win rate. Exact PPC Bid – the estimated median cost of an exact match PPC ad. 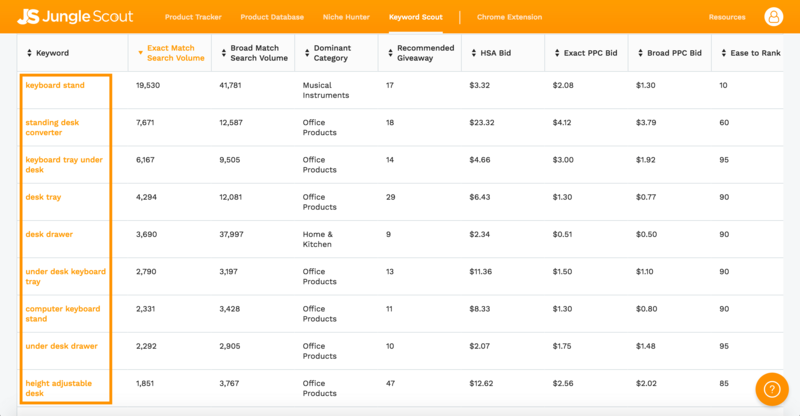 Broad PPC Bid – the estimated median cost of a broad match PPC ad. Ease to Rank Column – a scoring assignment from 0 to 100 that indicates a keyword ranking potential. Keywords with higher scores will rank easier. Relevancy Score – a scoring assignment from 0 to 100 that indicates how closely related the keyword is to seed keyword or ASIN. The higher the score, the more closely related to the seed keyword. So now that I have this list of keywords, where do we go from here? The first thing I like to do is search for a few different keywords as well as enter some of my competitors ASINs. As I’m going through this process I make sure to export each of my search queries as a CSV file and save it onto my desktop. We’ve been calling this thing a “keyboard tray”. However, is that what the general public calls this? I don’t know for sure. Let’s look at Keyword Scout to find out for sure. For this example, I’m going to do an ASIN search on one of my competitors. So we see that for exact match search volumes, “keyboard tray” actually is the most searched, but there are other things too, like “keyboard tray under desk”, “keyboard shelf”, and a few other strange words that we probably wouldn’t have thought of before. After I’ve done my keyword research and saved my different lists, I like to import all of them into one singular spreadsheet on Google Sheets (feel free to use Excel if you prefer). Having all of my keywords on one sheet makes it easier for me to filter through them or sort them accordingly. The reason that I’m doing this is I now am trying to figure out what my most popular keywords are to determine what keywords I want to include in my title, my product features, and my product description. We want to use all of our keywords throughout our listing, but our highest search keywords, those are the ones we want to include in our title. 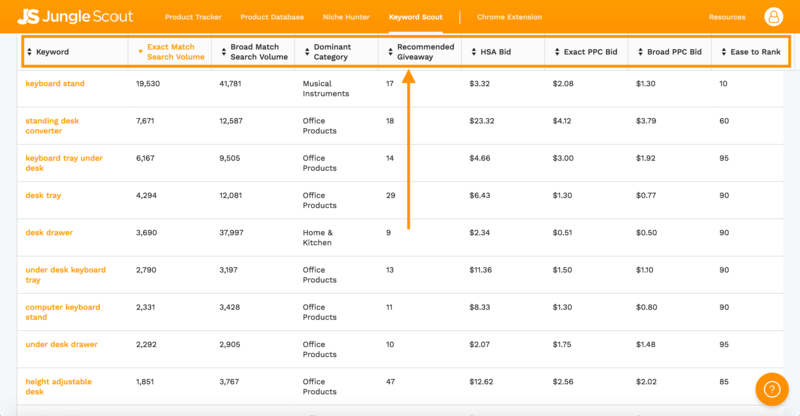 What we have to do here is decide which keywords are the most relevant, but also get the most search volume. Now that we have a decent understanding of how to do the keyword research, let’s use what we’ve learned for our listing! These keywords are going to be used both for creating our listing and creating our sponsored products, or our PPC campaigns on Amazon. In Amazon Seller Central, I’m just going to click on inventory and then add a product. Brand Name – This is where you should enter your brand name. This is important if you want to enter the Brand Registry at a later date because you need to enter the brand name that you will register a trademark under. You’re given five bullet points to essentially highlight the features and benefits of your product. I like to focus on the benefits because, at the end of the day, that’s what converts. That’s what sells. NO DRILLING OR SCREWS REQUIRED: This keyboard tray clamps on within seconds! No extra tools needed! Expand your desk space and clear the clutter with this EXTRA LARGE surface, sitting at 25 inches by 12 inches. DESIGNED WITH STYLE & COMFORT IN MIND: Don’t sacrifice style! Choose between our sleek Bamboo design or our Jet Black MDF board. Our specialty patented slider rail smoothly tucks away your computer keyboard and mouse pad when not in use. We have also added a comfort fitting foam for your wrist to rest on! EXTRA LARGE SURFACE: This is one of the largest and most spacious desk trays on the market! With a 25” x 12.25” surface you can fit your keyboard, mouse, and all your extra knick-knacks. TRIED AND TESTED: The Jungle Slider keyboard tray will fit most desks and has been tested at home and in the office. The tray is designed to hang below the surface of your desk however high enough to avoid knees! HEAVY DUTY: We start by sourcing the highest quality materials and craft them into a gorgeous work of art for your desk. We stand behind our product and offer a Lifetime Warranty. You’ll see that my first bullet point is the fact that there is no drilling involved. I think that that’s a HUGE selling point for this product. The fact that people can quickly assemble this and within seconds have it up and ready for use is addressing the biggest pain point of this product. In the bullet points that follow I like to highlight the features and benefits that makes my product different from our competitors. How will the product features solve a problem, or change the customer’s lives? This is where I want to include any keywords or any information that I couldn’t fit in my title or in my bullet points. 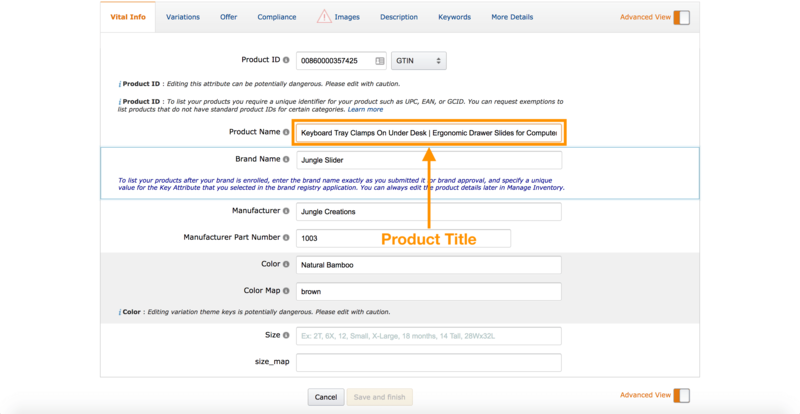 There is one last important section for Amazon sellers to know about and you can find it under the “Keywords” tab in the section titled “Search Terms”. This is one last area where you include any other keywords that aren’t in the product title, product features, or product description. Did you notice that I sprinkled in a few Spanish keywords? That’s because in the US Spanish is the second most common language and this could be a game changer between you and your competition. So go for it! Get your Spanish on! Related keywords: think about the use cases for the product, or who it is used by? We’ve filled out all of the main fields for our listing. Keep in mind that you can always edit these at a later date, so feel free to always come back. Always be improving your listing and don’t feel like everything that you want needs to be done right now. We’re just trying to get our listing started here and we’re going to iterate on it and improve on it for years and years to come. The last thing I’ll do is just click save and finish. And there we have it. Our Amazon listing is now created and once our inventory is in Amazons warehouse our product will be displayed within the search results. Start doing some keyword research of your own! With every blog post, we’ll be challenging you with “Action Items” to make the most of your MDCS journey. i have a product listed few weeks ago just to check if amazon puts that under HAZMAT review which luckily didn’t and know i need to make a variation on the listing but when i click the button it says the variation is not available for this product. is there any way or hack to add variations? if i delete the whole listing and make a new one, am i gonna be charged? Can i use the same bar-code for the listing again (obviously after editing the product detail on GS1)? 1. I can create the listing of my product even when I don’t have it. 2. When I will save the listing it will not be visible to the public at that time. 3. It will be shown to public when Amazon will receive my product and it will be done by Amazon automatically? 2. Yes. Listings aren’t visible until they’re in stock. Except for Amazon.com US, all other Amazon markets are greyed out in the keyword web app ?? I am a new starter for Amazon, I would to know more about how to start selling the products success and safe from the public complain and Amazon terminate account. The most important of first step is what products I can sell, and where to find them. Your website is very helpful and full of learning source for both beginning and profession online sale. I am lucky to know your site. Thanks god, you are the best of the best information. I was very impressed with this article, it was explained simply and effectively. Thanks! i created a title for my product and Amazon took it upon themselves to slap my brand name in the first 2 slots. When I asked them to change it, they said NOPE! Because it’s “recommended” in their guide to include the brand name first. Hello! I may not be able to make to the Live AMA this week but plan to listen to the replay. Rolando said the Chinese holiday has caused a delay in production. That means you struck a deal with the supplier. It would be great if you guys could talk more about how you negotiated your deal with the supplier? What was the back and forth conversation like? Can you provide examples ? I am in that negotiating process now. I am getting some responses back (not as good as I anticipated), but now what? Please help! Hey guys the only thing I didn’t understand is , why we have to have a massive keywords list if we are going to put roughly just a few of them on the listing?